happy & merry, it’s my first holiday giving guide (+ a cocktail recipe)! I’m always a proponent for making holiday gifts, especially the edible kind. For the past few years, I’ve compiled holiday lists for my favorite things to bake, make and give. But today I wanted to share some lovely things that I own and love that I think you or someone you’re shopping for would love too. 1. The Sprouted Kitchen cookbook . A great cookbook and one of my favorites this year. I’m actually not much of a cookbook buyer – I’m more of a borrow-it-from-the-library kind of gal. But this one, is very need-to-own worthy. The recipes aren’t fussy and the book is very down to earth. If you need a reminder, you can check out my post for the pumpkin granola I made from this book. 2. Douglas Fir Tip Tea from Juniper Ridge. After spotting this tea over at Lottie & Doof last year, I searched everywhere for it, but I couldn’t find it anywhere. Fast forward to last week when a tip from a Twitter friend mentioned that The Soap Dispensary had it available and my quest was over (if you’re in Vancouver, this shop is an absolute gem). The tea doesn’t taste like tree, but some thing more like citrus mingled with pine. It’s mellow and awesome and it comes in a pretty tin so it makes giving easy. Just make sure you steep it for at least 10 minutes for a true flavour forest. Note: One of my favorite teas is this Sweet Rose tea . The packaging isn’t pretty for giving, but it’s delicious – even for someone who isn’t into drinking flowers. I call this my magic tea, it’s that good. 3. Fancy Silicone Spatula. I should point out that I was sent this from the makers, so I didn’t purchase it, but man, it’s a great spatula and I’m picky. I used to have a great one that I got as a wedding gift and gave it to others as stocking stuffers. It was awesome until it cracked in two. The replacement wasn’t half as good so I made due with sub-standard versions…until I got this one. Granted, it’s pricey – not everyone will want to spend $22.50 on a colourful spatula, but it’s heat resistant up to 464°F and nearly indestructible, so that’s worth it to me. And it comes in 2 different shades of pink! 4.Thymes Frasier Fir votive candle . I LOVE this candle. I’ve been buying it for years and I light it only during the holidays. It’s special to me and it makes my house smell like a wonderful pine forest. The votive size is great for giving and comes boxed in a pretty glass container. If you’re in Vancouver, you can buy it at the Gourmet Warehouse or Welk’s. 5. Spicebox Spiced Whisky. Truth: I was suckered into buying this at the liquor store because of the pretty label. I had a shot glassful of it and hated it. Too sweet and too much vanilla for me to enjoy it straight. But then I made a cocktail with it and I now have found this year’s winter cocktail. Jot down the recipe below on a card & pass along a bottle to a good friend and buy a bottle for yourself too. Pour whiskey, lime juice and bitters into a pretty glass. Add ice and cover with ginger beer. Drink up. Repeat. 6. Popcorn Lip Scrub. I’m not one for beauty routines, so I’m not sure why I love this lip scrub so much. It’s a bit awkward to use….but it also tastes really good – think salty-sweet butter caramel, less popcorn. Also, I think it’s a bit of a novelty for me – I use this in the morning and at night and then follow up with my shiny lip gloss. I’ve been using it for over a month and probably for the first time in the winter, I have decently soft lips! A fun little stocking stuffer. Note: You could always try making your own lip scrub to give away as gifts. I’d think mixing some coconut oil, honey, sugar, a good pinch of flakey sea salt and maybe a dash of butter extract could give you a similar flavour. Experiment! 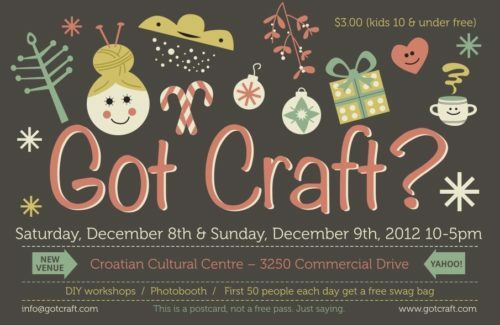 If you need more gift options and will be in Vancouver this weekend, this is Got Craft weekend!! Got Craft is my favourite craft fair in town and this year it will run on Saturday & Sunday at the Croatian Hall on Commercial Drive. I’ll have my Beautiful Project table selling greeting cards, holiday cards, birthday calendars, prints and recipe cards. If you stop by, please say hello – I love meeting blog readers! And see that cute postcard image? I did the illustration & design! I really like reading Holiday Giving Guides. I should get that cookbook. Thanks for the great gift ideas! I myself am dying to get a copy of that book! I also fell for the pretty bottle of Spicebox Whisky and was disappointed by how sweet it was. Thank you for the cocktail recipe, it sounds delicious! 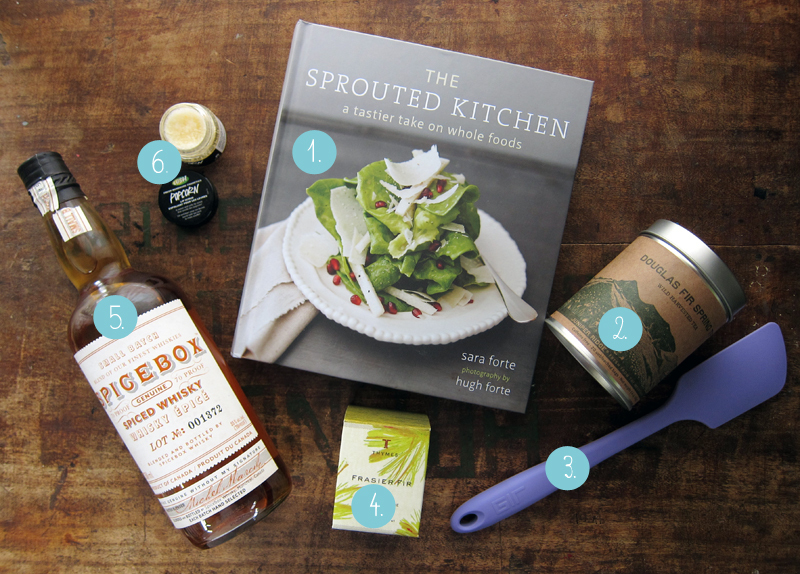 I am so excited for a recipe for Spicebox whiskey! I bought it over the summer and found the sweetness really off-putting–I ended up drinking it straight while camping, and this looks way better. Oooo, a fir scented candle, perfect idea for my purple-fake-tree home. And I’m keeping an eye out for those teas too. It’s also nice to know I’m not the only one who gets suckered by a pretty liquor label. That candle is exactly what I’ve been looking for. Thanks! That postcard is too cute! Great work. And I haven’t heard of Spicebox Whiskey, but I’ll have to give it a try. We’ve been drinking Manhattans like they’re going out of style around these parts, so I’d love to try a holiday twist on that old chestnut. I have the Sprouted Kitchen cookbook on my Christmas list… fingers crossed it appears under the tree for me! Great list, thanks for the ideas! Cute ideas! The tea and candle sound so cozy. I visited a Lush recently and was a bit overwhelmed by the choices. I like the sound of that scrub! An inspiring list of items I had never even heard of. I have a similar designed spatula and I love it! No seams/grooves for residual food stuff to collect in. Just a smooth silicone covering and a sturdy handle. I also like the sound of the popcorn lip scrub. Too bad I get ill whenever I walk by LUSH. I’m sure it has some great products I’ve yet to discover. You should ditch the Spicebox and get Wiser’s Spiced. Way smoother. Helene, me too – glad you liked this one! Amanda, it’s worth it. Go! Christina, we’re not the only ones it seems. The cocktail saves it. Phew! Connie, glad you found what you wanted. It’s a really great spatula. Yes, trefoil, in a cocktail it’s so so so much better. A million times better! Enjoy it, foodwithpictures! It’s my favorite. Aw, thanks so much Erica. That makes me feel great 🙂 yay! Thanks Sara, I’m a manhattan fan so I understand the lure well. Nicole, Lush is totally crazy….especially their super helpful employees, but you can always order online too. Thanks Bijoux! Hooray for great spatulas! Jane, I’ll try it out. I had no idea there were spiced whiskies out there. I’ve only seen spiced rums.